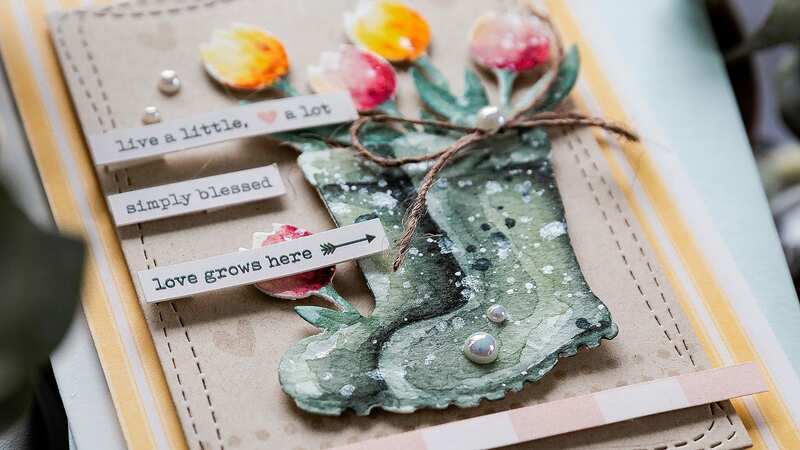 I was dying to use the Rainboot Planter die from the recent Simon Says Stamp April Card Kit, and so as soon as the kit arrived I delved right in! I’ve linked all supplies at the end of this post. Compensated affiliate links used where possible at no cost to you. 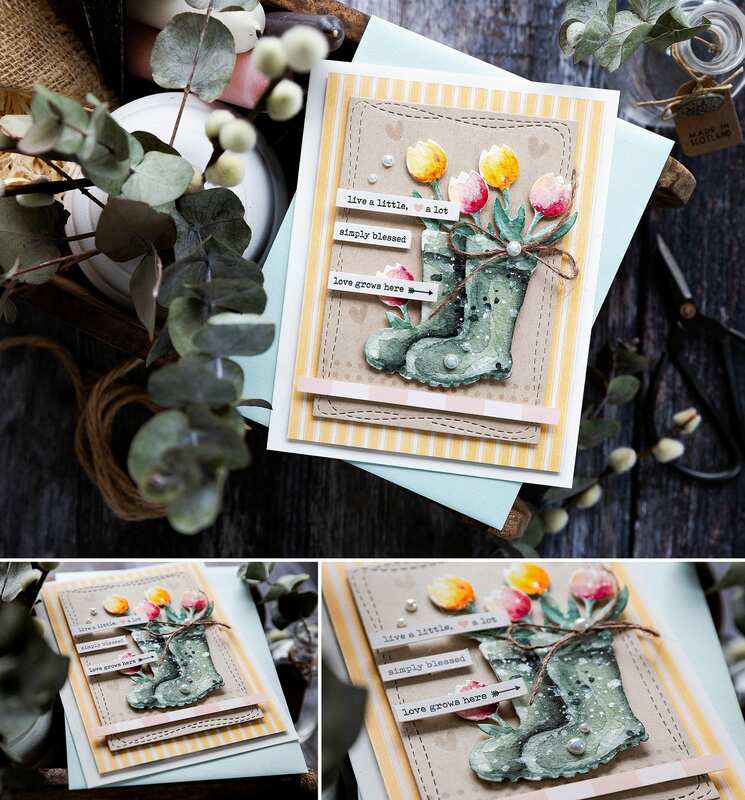 Surface texture affects how the paint behaves, and I do like texture, so I was excited to try the Rough card with the Rainboot Planter die and my Daniel Smith watercolours. For the rainboots, I used Perylene Green and Lunar Black in the shadows, and for the flowers, I used Quinacridone Coral, Quinacridone Gold and Alizarin Crimson. I painted starting with light layers of colour and then working to deeper tones, layer by layer until I was happy. 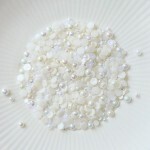 After which, I splattered leftover paint, Perfect Pearls solution and White Gouache to give more interest. 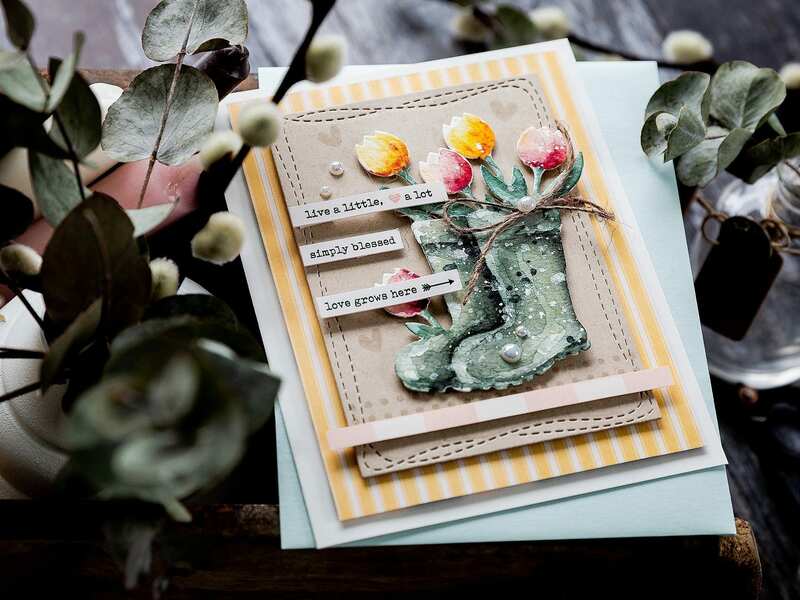 I die cut a Wonky Rectangle die from Neenah Desert Storm 100lb card and stamped a polka dot border from the kit Hello Darling stamp set along the bottom using Versamark Ink for a tone on tone look. 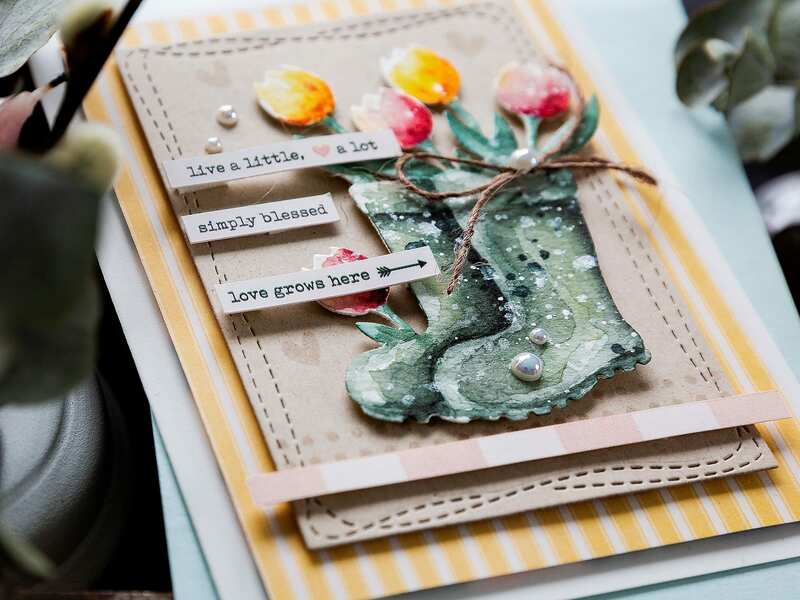 I then foam mounted the rain boots on the panel using the polka dot border to ground the die cut. 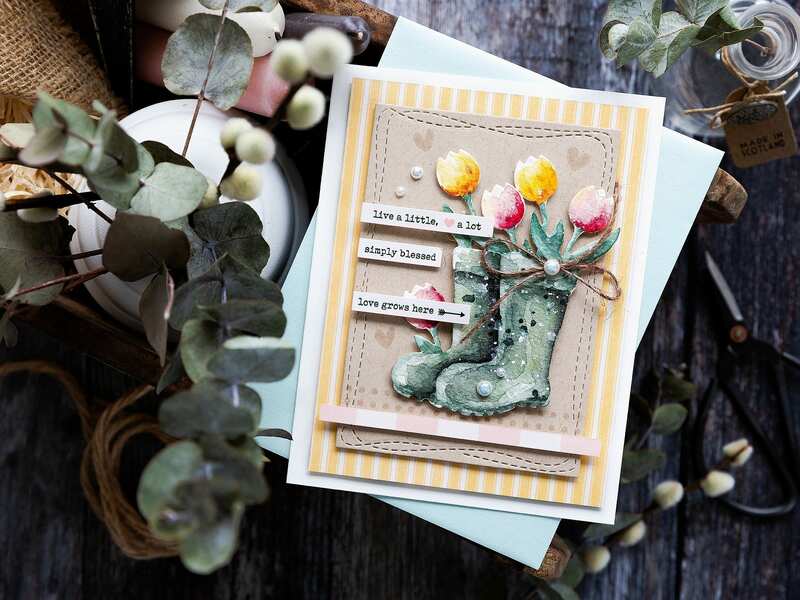 I added a strip of Simple Stories Farmhouse pink striped paper and a trio of Simple Stories Farmhouse stickers again with foam adhesive. Then I mounted the panel on Simple Stories Farmhouse yellow striped paper which in turn is foam mounted on a card base cut and scored from Ivory card. 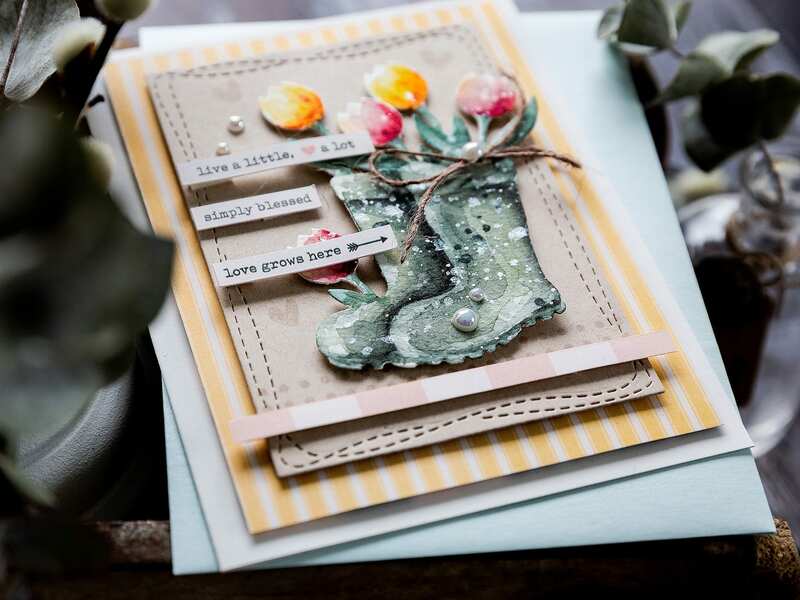 I added a trio of pearls and a twine bow topped with a pearl too and then used a small heart image from the Hello Darling set on a small acrylic block and stamped a few hearts around the welly boots in clear embossing ink to finish the card. 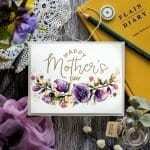 I paired the card with the Metallic Sea Glass envelope included in the kit. This is one of those things that just grabs your attention and makes you say WOW !! I was immediately captivated when this lovely little gem showed up in my Simon Says Stamp email .. Clicked through.. pinned it .. And I keep coming back to scrutinize every little nuance .. Simply STUNNING ! !